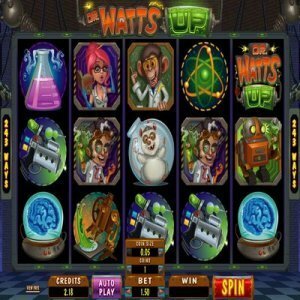 [mrgreen] Dr. Watts Up Slot machine is an online slot developed by Microgaming. The game is based around wacky scientists. There are a series of characters performing different kinds of odd-ball experiments. This little is designed in plenty of shady purple and toxic green colors. It offers much in terms of originality and honesty of casino play. This is a 5 reel, 243 ways to win slot machine. This means that you can win the casino game in 243 ways. The paylines in this game are unalterable. Coin sizes in this online vary from £0.01 to 0.20 per coin. The bets can consist of 1 to 20 coins. You are allowed to bet £0.30 per spin. For the maximum bet, you are allowed to place a maximum of £120 per spin. Each reel has an animation of a mad scientist. The scientist pays you a huge amount of 15,000 coins if you manage to match five symbols. These symbols include a mad monkey, a lovely pink haired assistant and a robot. These are the top paying symbols. Other symbols include a brain, a microscope and slug, and a phial of smoking purple. There is a surplus of playing symbols, which makes the game more enjoyable. There are several bonus features in this game. These bonus features are triggered by the scatter symbols. The scatter symbol consists of nuclei logo with black and yellow warning trim. When 3 of these scatters are located in the same reel, you will receive a payout of 3,000 coins. When 4 scatter symbols are found on the reel, you will earn 9,000 coins and 30,000 coins if 5 scatter symbols are located on the reel. You can also use scatter symbols to activate free spins. Three, four or five symbols automatically generate ten, fifteen or 20 free spins in the bonus round. For every free spin you receive, a random reel will be turned wild. Your wins will be automatically multiplied by your total bet. It is important to note that free spins can’t be reactivated. Also, the game doesn’t allow players to trigger bonus game when playing free spins. You can only play free spins at the same rate the standard game was before starting the free round. 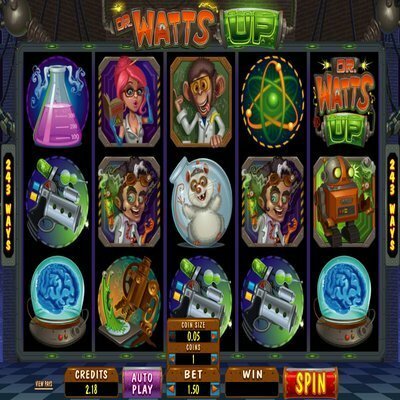 There is only one free symbol in Dr. Watts Up slot. You can use this slot to substitute other symbols to get a winning combination. However, it is important to note that the wild symbol cannot substitute scatter symbols. You can also use this wild symbol to win a standard jackpot. You win 50,000 coins if you manage to have 5 of this symbol on the reels. The jackpot for this game is fixed at 480,000 coins. The jackpot is determined by the bet you have placed and the coin value ratio set if you win the jackpot.